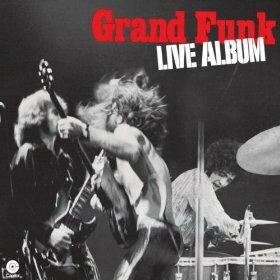 Talk about doing what it says on the tin, Live Album is a live album by Grand Funk Railroad. It was recorded June 23–25, 1970 in Florida and was released in November 1970. Live Album was originally a double album on vinyl and the order of the songs had to be changed to fit the four sides. Since the album fits onto a single CD, the original order of the set list from the concert has been restored. Grand Funk Railroad were very popular with the public but weren’t liked by the music critics. I haven’t seen it on any of their best live albums lists. Feedback on Amazon though is very positive if you like hard rock. Do you think that this album is the best Grand Funk Railroad live album? This album is included in the best hard rock and heavy metal live albums poll. This entry was posted in 1970s Live Albums, Heavy Metal Live Albums and tagged 1970 live albums, 1970s hard rock, Grand Funk Railroad Live Albums, Heavy Metal 1970 by Paul Simister. Bookmark the permalink.